Last night, Joey, Elizabeth, and I ate at a terrific local restaurant. The buffet was full and beautiful, the staff was friendly and helpful, and the restaurant was clean and tidy. There was only one thing that put a blight on dinner. We were the only customers in the restaurant…. As you know, I am a staunch supporter of small businesses. To see a family owned business trying so hard and not having any customers absolutely makes my heart ache. As the daughter of former small business owners, I know exactly how much each and every customer means to a small business owner. Sometimes two or three people’s purchases can make the difference between coming out ahead or behind for the night. So here’s my question. Why are more people still not wholeheartedly supporting small businesses? What makes it okay to go to a huge national conglomerate, but skip over the folks that live down the street? Why do many people unhesitatingly buy large quantities of cheap, plastic, junk, that will break in two weeks from the big box store, but really have to stop and think before buying a quality handmade item from a local craftsperson? These questions really bother me. As I drive through our local towns, I see lots of empty and run down buildings. My mind can’t help but slip back to what those buildings once were: hardware stores, movie theaters, mom and pop grocery stores, clothing stores, shoe stores, cafes, florists, and more. I can picture what those towns looked like years ago with everyone coming out on Saturday to do their weekend shopping. Older people still talk about those days and how great it was to see all your friends when you came to town. Everyone remembers the shop owners. Some were grouchy, some had hearts of gold, some had kids, some lived alone. The one thing that stands out is the overwhelming sense of community and pride that customers and store owners showed. So here’s another question. Why can’t we do it again? Why can’t we bring back our thriving downtown areas and main streets? How many talented people do you know that would be great at running their own dress shop or small grocery or hardware store? I can think of about ten people right off the top of my head and I bet you can to. How many of you have ever had this conversation with someone? I think many of us have had similar discussions about this with friends or family. I feel that as a society, we are really cheating ourselves by not giving more support to small businesses. We are missing out on a chance to buy unique good and services, to revitalize our small towns, and to have a personalized shopping experience. Personalized shopping experience? Here’s what I mean by that. Think about the last time you went into a large big box store. Was anyone glad to see you? Really? The greeter probably really isn’t unless they are your personal friend. Did anyone in the big box store say something like, “Hey! It’s great to see you! Did you enjoy that salsa you bought last week? I hope you tried it with the homemade tortilla chips like I suggested. It’s just delicious that way!”. Did anyone in the big box store even know who you were or what kinds of things you like to buy? Did they recommend anything to you that they had just made or got in? No? Shocking! Now, let’s think about the last time you shopped at a local small business. When I walk into one of these stores, it usually reminds me of the television show “Cheers”. Remember when someone walked into the bar on that show and everyone turned and said, “Hey!”? Well, that’s kind of how it goes. If you frequent a small business, the owners and staff usually get to know you. They remember you and what kinds of items you like to buy. Your purchases (or lack of purchases) personally affect their lives. Another advantage is that small business owners typically know what’s in their store and where it’s located. Have you ever been in a big box store and asked where something is located, and the person you asked had no idea, and had no desire to find out? Very frustrating. So, my point is, we all need to do our best to support our local small businesses. I don’t think anybody wants to see more empty buildings with for sale signs. If you are making a weekly trip to the big box store, simply stop. Look around your area and see if there is anywhere else you can get what you need. You will be surprised at all the wonderful small stores there are out there. You can make a powerful difference in the lives of people in your town just by changing where you shop, or you can shop at the big box stores and huge national conglomerates and contribute to…well…nothing worthwhile. Let’s start a shopping revolution! Start today and support your local small businesses! 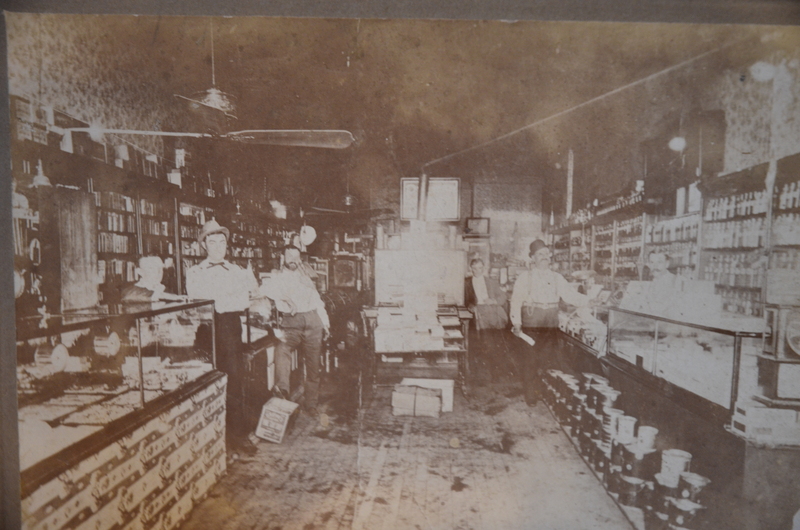 The picture below is my great- great- grandfather’s small business. You could have found anything you were looking for in his wonderful store!